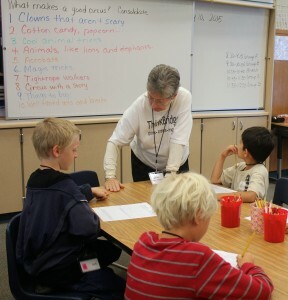 Each day, campers will be challenged to organize, develop, examine, expand, and explain their creative ideas. As part of our morning together, curious young minds will create thinking portfolios while stimulating and improving their cognitive and lateral thinking strategies. What does that mean? There are no wrong answers! Tasks are done with drawings and input. For example, when asked to “Show someone how you would catch a turkey,” a camper responded: “A turkey is walking, but I saw it on my machine. The holes turned bigger on my cage, so the turkey went in to get the oatmeal. Once he was inside the cage, the holes turned smaller, so he could not get out.” The forming illustration by the camper was examined, labeled, and discussed. “A favorite activity is taking four words, representing four distinct ideas, and finding a way for the concepts to intertwine and become related. 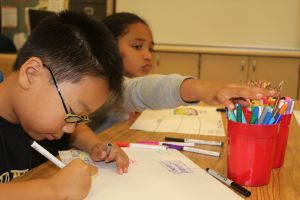 Students are challenged to think creatively and to find original connections. These brain exercises feel as good intellectually as a workout feels to your body.” Laura Shain, Past Principal, Ocean Shore.